These fantasy lenses are manufactured with the latest technology in cosmetic lens manufacturing, achieving spectacular finishes. These quarterly lenses, manufactured with high quality material, allowing a good passage of oxygen to the cornea, which implies that they maintain exceptional eye health. Inno 3 Tones Burning: With them you can change the color of your eyes easily and thanks to the harmony of its three colors, will add depth to your eyes with a soft touch of color in your eyes. The colors available in 3 Burning Tones are Aqua, Hazelnut, Blue, Light Gray, Dark Gray, Brown, Honey, Green, Violet and Sapphire. Graduates can be ordered from 0.00 to -6.00 (steps of 0.25) and from -6.00 to -10.00 (steps of 0.50) in the colors Blue, Brown, Dark Gray and Green. Inno UV: Inno UV fantasy contact lenses look perfect under natural light, but under ultraviolet light they light up, creating a spectacular look. Inno UV gives you a feeling of comfort, hydration and freshness all day. They maintain the same tone before and after using them, providing a fantastic effect. Colors: Yellow, Blue, White, Purple, Orange, Red, Pink and Green. 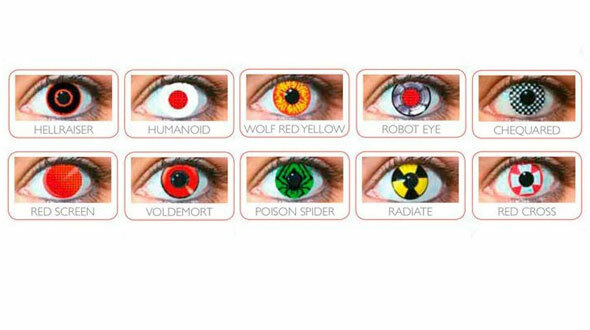 Inno Funky: Funky contact lenses are an excellent choice if you want to stand out from the crowd, these fantasy lenses will give you a comical or horror, theatrical and unique look. The Funky are ideal to wear in nightclubs, Halloween, costume parties, carnival or even for those who want to take them daily. They are quarterly lenses, very comfortable to wear, providing hydration and freshness to your eyes all day. Colors: Anaconda, Avatar, Black Cross, Black Spiral, Black Star, Blood Shot, Blood Splat, Blood Drops, Blue Manson, Blue Star, Cat Eye, Chequared, Cyborg, Darth Manul, Demon Eye, Dragon Eye, Eclipse, Green Werewolf , Hellraiser, Humanoid, Leopard White, Lunar, Mad Hatter, Mickey Mouse, Optical, Orange Werewolf, Poison Spider, Radiate, Rage, Red Cross, Red Screen, Red Spiral, Red Vampire, Robot Eye, Saw Blue, Saw White, Smile , Stitched Mummy, Twilight Bella, Twilight Breaking Dawn, Twilight New Moon, Twilight Volturi Vampire, Viper, Virus, Voldemort, White Demon, White Mesh, White Swirl, Wild Fire, Wizard, Wolf Black Orange, Wolf Black Yellow, Wolf Eye, Wolf Red Yellow, X Fires, Yellow Werewolf, Zebra, Zombie Gray, Zombie White. Inno Glamor: These are monthly, neutral lenses, made of Hema Coopolymer material, with 48% water. The available colors are Blue, Green, Violet and Pearl. The presentation of these color lenses is very special, since they come with a set of makeup that includes: the colored lenses + eye shadow + mascara. In Prodevisión you can buy Inno fantasy contact lenses quickly and with secure payment.